Pictured: Formerly a recreation management director and ropes course instructor, Audra Trnovec, of Oxford, is now leading students through academic challenges as an advisor in the University of Mississippi’s Bachelor of General Studies degree program. Trnovec joined the department this spring. OXFORD, Miss.­­­ – When she first started college, Audra Trnovec thought she wanted to be a cruise director like Julie McCoy on the ’70s television show “The Love Boat.” Although her career journey never took her out to sea, Trnovec’s path has had a few twists and turns. 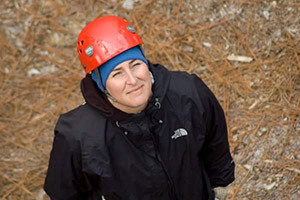 The new academic counselor in the University of Mississippi’s expanding Bachelor of General Studies program, Trnovec ran outdoor adventure programs with two different universities for more than 20 years before making a change that would allow her to continue guiding students into unknown territory. The difference is that this journey winds up at their future careers. “I like a challenge,” Trnovec said. “I guess that’s why I like my job. It’s similar to leading people in a ropes course. I’m helping students navigate academic and career decisions. Originally from northern Illinois, Trnovec attended Iowa State University to pursue a degree in recreation management. “I found out that cruise directors had to work 18-hour days, so I changed my mind about that particular career goal,” she said. Crediting her academic adviser for steering her in the right direction in her career and later suggesting graduate school studies, Trnovec said that she respected her adviser for asking her the tough questions. It was her adviser who first mentioned the possibility of part-time work in the college’s recreation program. She took the job and worked as a student assistant in the program for the next three years. After completing her bachelor’s degree, Trnovec stayed on at Iowa State to complete a master’s degree in higher education and student development. Shortly after, she was offered a full-time position as the coordinator of outdoor recreation programs. Part of Trnovec’s position included mentoring and guiding students through the undergraduate program, just as her mentor had done for her. In 2001 Trnovec became the assistant director of outdoor recreation at the University of North Carolina at Wilmington, where she oversaw the Seahawk Adventure program and helped facilitate travel programs, surfing workshops and fly fishing lessons. After getting married, her next move was to Indiana State University, where she took a position in the college’s career center as a liaison for the College of Health and Human Services. The next leg of her journey brought her to north Mississippi, when her husband, Bud Edwards, came to serve as the director of the UM Counseling Center. “He went to Ole Miss and wanted to return home and help his community,” Trnovec said. Upon coming to Oxford, Trnovec interviewed for a position as an academic adviser in UM’s Center for Student Success. She also began teaching the EDHE 105: Freshmen Year Experience course. In the Center for Student Success, Trnovec worked with students who had yet to declare a major. In March, another challenge came her way when Trnovec landed her new position with the Bachelor of General Studies program. 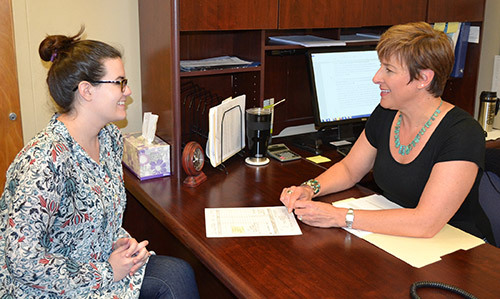 With the addition of Trnovec, the BGS advising office has a great team assembled to guide students in their educational journey, said Terry Blackmarr, assistant to the dean in the Office of General Studies. When she is not working with students, Trnovec is a student herself, working on a doctorate in higher education at Ole Miss.